Our kids are living in an age when they have the tools to bring their ideas to life like never before, and I think we must expose them to this tools and technologies. During the last week I have been conducting a workshop for elementary school kids, on the topic of electricity, electronics and robotics. The purpose is having fun learning about science with this cool activities. Enjoy interactive activities helps kids understand the amazing world of electricity and digital technology. The workshop was open to registered kids between 8 and 12 years, and we invited them to group up in teams of 2 people. I am so happy to see kids experimenting with electronics and micro-controllers, and have had similar experiences in the past, so I was in charge of designing the contents and conduct the experience. My approach is basically to introduce them some concepts, make some practical experiments about it, and immediately apply the contents building some thing. Soldering skill: Teach kids the basics of soldering and let them experiment for themselves, using a soldering iron. Children can work by themselves or in pairs, depending on numbers. To have built the “Simple memory game machine ” – core module (first day’s practice). We will continue next week, and we’ll keep you informed about next sessions. 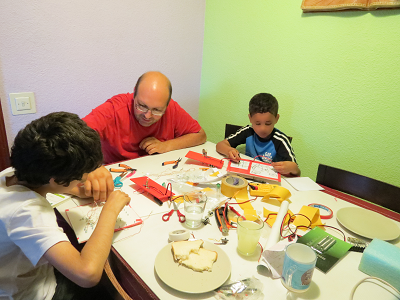 ¿Are you working with kids on any electronics projects? If so, or you’re interested in receiving more information, please post them in the comments so we can write about it! Thank you very much!